Having trouble with your computer? We can diagnose and repair! Is your wireless network is secure? We can secure it properly! Need to upgrade your memory or hard drive? We are the upgrade experts! If you need ANY of our services, you are in luck as we are currently running a New Year’s New Customer Appreciation Flat-Rate* Special Price of $65.00 for ANY remote/online support or on-site service needed. Just mention this post. Give us a call now at 817-715-TECH or schedule an appointment online now! Check out our ad as shown here in the Wedgwood, Cityview and Ridglea Shopper News papers on Wednesday 1/8/2014! * Labor Only, any parts (if needed) would be extra but will be quoted prior to any work performed. Posted in Specials and tagged computer repair, computer upgrades, on-site service, remote support, special price. 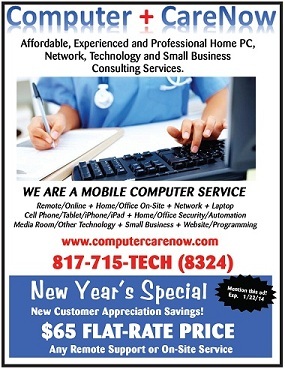 Laptop PC Mac Repairs, Upgrades, Sales, Tech Support and Consulting for home and small business. Serving Fort Worth, TCU, Crowley, Benbrook, Granbury and surrounding areas.